Crosses and Qurans were raised in Cairo’s Tahrir Square this week. Editor's Note: Ashley Makar is a graduate student at Yale Divinity School and co-editor of Killing the Buddha. Photos from Cairo show triumphant hands in the air - some raising up Coptic Christian crosses, others holding up Qurans. Egyptian Christians and Muslims gathered together this week to pray for those who’ve died in the uprising against President Hosni Mubarak’s regime. Muslims formed a protective circle around Christians as they prayed in Cairo’s Tahrir Square on Monday, just as Christian protesters had done for Muslims during last Friday’s prayers. As the daughter of a Coptic-American immigrant to the United States, I’m astonished by such sights. In the many summers I’ve spent between Cairo and Alexandria, I’ve never seen Christian prayers in a public square. I’ve never seen a cross anywhere near a Quran. Most Egyptian Christians are Coptic, a group of orthodox Christians who trace their lineage to St. Mark, the apostle who evangelized Alexandria in the first century. The majority of Egyptians were Coptic by the seventh century, when Arab Muslims brought Islam to Egypt. Today, Copts constitute around 10 percent of Egypt’s population. Christian-Muslim relations in Egypt have been contentious, particularly in recent months. On New Year’s Eve, 23 Copts died in a church bombing in Alexandria. On New Year’s Day, Coptic protesters threw stones at a nearby mosque, clashing with local Muslims and riot police. The Egyptian government blames the Alexandria church bombing on a foreign terrorist group linked to al Qaeda. The government continues to investigate the bombing. But from Washington to Cairo, Copts are venting doubts about the integrity of the probe. It’s the talk of the Coptic town. 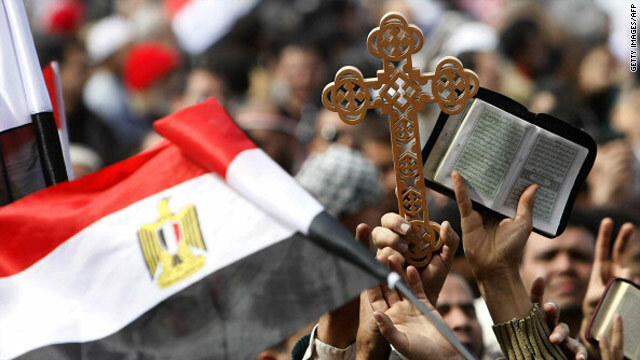 And it's one reason for a new solidarity between Egyptian Christians and Muslims. Copts can’t trust the government to protect them. Some discern a pattern of Mubarak provoking Muslim-Christian strife to distract Egyptians from government corruption. When militant Islamists become scapegoats for violence, the Mubarak regime gains brownie points from U.S. supporters for helping the fight against terrorism. At the same time, Copts really do feel vulnerable to Islamist attacks. Coptic churches received threatening letters not long before the Alexandria church bombing. Simply put, Copts don’t know who to trust. Too often, I’ve seen that feeling of vulnerability morph into anti-Islamic sentiment. I’ve often found myself defending Muslims in conversations with Coptic-Americans. It’s true that Copts have long been persecuted in Egypt, often at Muslim hands. Some Egyptian Christians have been killed by Muslims in recent years. But I haven’t seen the Coptic Church do much in the way of reconciliation. I’m grateful for my Coptic heritage, especially for the beautiful litanies - ancient Coptic prayers - that I often recite on my own. But I can’t wholeheartedly be part of a church whose theology is too orthodox to engage in interfaith dialogue. Many Copts are ambivalent about the uprising against the Mubarak regime. Though the official church remains silent on the demonstrations at Tahrir Square, Copts have participated in large numbers. Egyptian Christians are excited and afraid: Excited to rally with the secular youth who began the anti-Mubarak demonstrations, largely through Facebook and Twitter. Afraid that the Muslim Brotherhood will swoop in and take the reigns. Excited at the prospect of a democratic Egypt. Afraid that free and fair elections could turn into Islamist rule. Until this month, Copts have tended to prefer the repressive stability of the Mubarak regime over radical change that may put Islamists in power. As my dad’s Coptic-American friends say, the devil you know is better than the one you don’t. But I’m cautiously optimistic that real change is happening in Egypt, that the solidarity between Muslims and Christians, between urban elites and rural farmers, and between computer-savvy youth and illiterate workers - is sustainable. My dad left Egypt decades ago and settled in Birmingham, Alabama, where he has a small Coptic church community and invites Egyptian friends over for dinner - Christians and Muslims alike. The opinions expressed in this commentary are solely those of Ashley Makar.